This chapter was composed by David as a prayer to God to foil the devious schemes of the conspirators who sought to bring about his downfall through deceit and libelous charges. 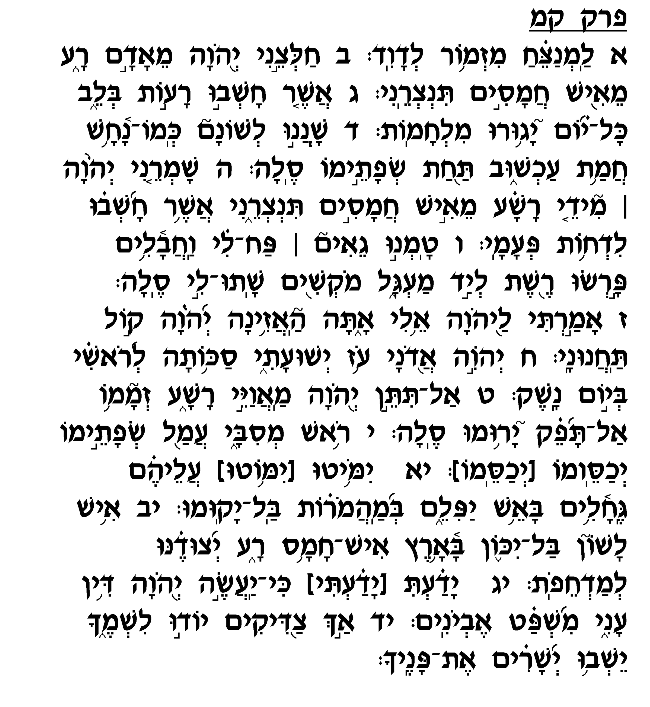 Ibn Ezra and Radak explain that this Psalm was composed during the period when David was pursued by King Shaul, when men such as Do'eg Ha'adomi (Shemuel I 22:9) and the people of Zif (Shemuel I 23:19) cooperated with the king in his pursuit. David understood the danger posed by the conspirators, who sought to seize the opportunity to win Shaul's favor by joining his campaign to discredit David and have him killed. David thus naturally turns to God for assistance and begs that He rescue him from his shrewd, manipulative enemies. In this prayer David employs a number of different images in analogizing the cruel maneuverings of the conspirators. In verse 4 he likens them to a venomous snake, which attacks its enemy suddenly, unexpectedly, and without being seen. Slanderers, too, assault their targets inconspicuously and from a distance, disseminating false accusations that ultimately ruin the victim's life. Later, in verse 6, David enlists the image of snares and traps set by hunters. These, too, allow a person to capture a target without direct confrontation, just as the slanderer assails the victim without ever having to appear before him in person. Towards the end of this Psalm (verse 12), David prays that the "Ish Lashon," those who misuse the great gift of speech, should never become firmly rooted or established on earth. Beyond his immediate crisis, David feels concern over the state of society at large in light of the preponderance of deceit and falsehood. Relations between people depend to a large extent on their ability to trust and have faith in each other, to believe what they are being told. David experienced firsthand the mortal danger of falsehood, and thus beseeches the Almighty to see to it that the disseminators of lies will fail in their schemes, and honesty, integrity and truth will finally prevail throughout the world.